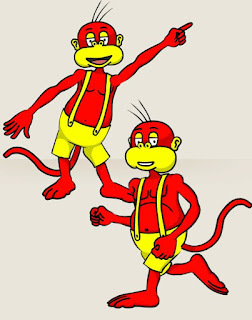 Reddy the Color Monkey. Now available. 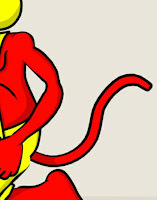 Reddy, the Color Monkey, is now available to buy in my Reallusion Marketplace store for your next CrazyTalk Animator 3 production. It's been a long journey that began way back in 2011, when I first tried to create him as a CTA, G1 character. Then again in 2014, I attempted to create him as CTA2, G2 character. Each time the process or life in general got the better of me, but with CTA3's G3 character rigs the process of creating characters has become a lot more achievable and, most importantly, less tedious (though I'd say it's still challenging if you want your character to be fully featured)..
Reddy is available in two angles, Front and Side (a.k.a. 315 degree) views. Both angles feature a full range of hand and face sprites, as well as additional front facing feet sprites. Both are compatible with CTA3's facial puppeteering system and G3 human character motion library. Also available is Reddy's Tail, which is a G3, Spine Actor. Just position where you want Reddy's tail to be then link it to his hip bone and it will move with him. The tail its self needs to be animated independently of Reddy, which you can do either by using existing motions for spine characters or manually key framing it yourself so it can match Reddy's movements precisely. Watch the video below to see a demonstration of Reddy's features. Each view of Reddy can be trialed for free and purchased separately. If you want his tail you'll need to buy that separately too. Reddy is also available to buy as a pack that includes both views and his tail at a significantly lower price than if you were to purchase all three separately. If that wasn't enough, you can also purchase Reddy's brothers, Super Bluey and The Great Greensbury, either as separate components or in complete character value packs just like Reddy's. 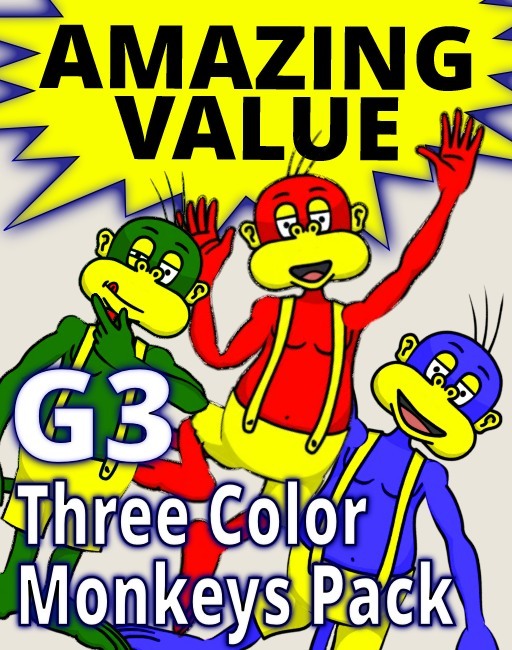 If, for some crazy reason, you'd like to own all my color monkeys, then the Ultimate Color Monkey Pack is for you. 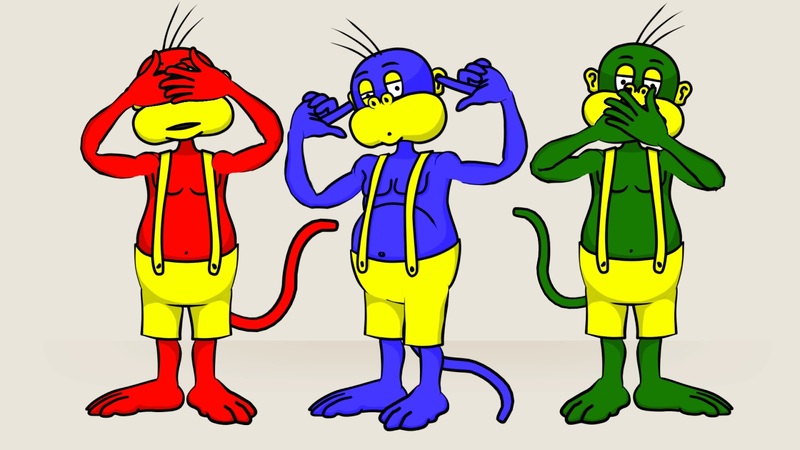 Not only does it contain every view for all three monkeys, and each monkey's tail, but the total cost is about 47% cheaper than if you were to buy each monkey in his own individual pack. Personally I'm looking forward to finally creating some animations with my own G3 characters. If you do decide to purchase my color monkey's I'd really love to see how you use them. Maybe I can even feature your work in this blog. 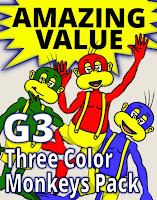 my color monkeys have got you covered.